Our mission is to help form Catholic/Christian graduates who are preparing to hear and respond with courage to whatever vocation they have been called to by Christ; to form good citizens who carry out their life’s work according to Gospel values, whether it be to married life and parenthood, or to religious life, priesthood, or some other way of life in service to God and country. Accumulating knowledge solely for the sake of knowledge is not an aim of the school. Rather, the curriculum aims to teach students how to use the knowledge they obtain for the purpose of living as men and women for others. In this way, students of Our Lady of Mercy Catholic High School will develop a sense of profound gratitude and appreciation for the privilege of their quality education, in turn fostering an awareness of individual responsibility to self and community as a means of deepening a commitment to peace and justice. 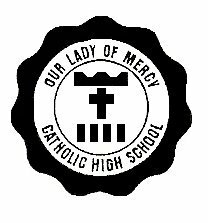 Education at Our Lady of Mercy Catholic High School is a transformative experience. We form students who not only excel academically but who also strive for justice and who will commit their lives to service for others. We strive to create the future leaders of our islands who lead with compassion, respect, and concern for the least among us.